UPDATED March 07/11 — after returning home yesterday from Sunday’s tumultuous Truth and Reconciliation Rally on Feb 27/11, and our unsuccessful attempt to place a symbolic Healing & Reconciliation Apology monument on the road allowance near the entrance to the occupation site in Caledonia, I forwarded some initial thoughts and references to Natasha at MooseAndSquirrel.ca who has been kind enough to not only cover this story, but also share my speech notes with her readers since I have not had time to do so. PHOTO: The photo above is of Mary Lou Ambrogio, VP of International Free Press Society (Canadian chapter) giving her speech on Sunday in which she speaks about preserving free speech, and announces that her organization is co-sponsoring ‘Caledonia:No More Nightmares‘ in Ottawa, March 22/11. From L-R: Christie Blatchford, Ernie Palmer (Caledonia resident, in background, head turned); Doug Fleming; Peter Kamerman, Mary Lou Ambrogio, Merlyn Kinrade. I have been busy since Sunday with work related to Sunday’s event as well as planning for the ‘Caledonia:No More Nightmares’ event which is being co-sponsored by the Free Thinking Film Festival (of ‘Iranium’ fame), as well as other related stuff I can’t talk about just yet. 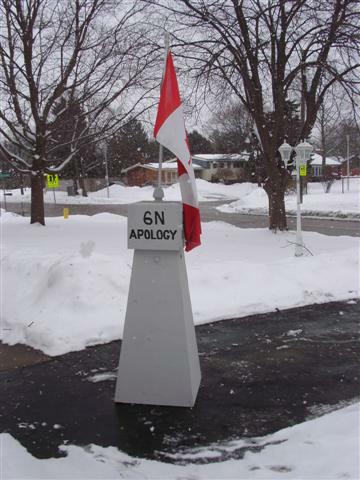 I was assaulted (but unhurt) as I was carrying our Apology monument. We have identified the man. You can see video of the assault from a CTV video available at the Moose&Squirrel story above. More video will be placed on YouTube when it’s ready. I don’t have anything to do with that, so I can’t say when it will be available. Jeff Parkinson (http://www.jeffparkinson.ca/) is working on capturing more photos from the videos which will be posted here when available. Feb 24/11: LETTER TO CHRISTIAN LEADERS re Truth and Reconciliation Rally in Caledonia on Sunday Feb. 27 at 1p.m. This entry was posted in 2. VoC's Favorite Post, Caledonia Players, Christian Peacemaker Teams, Crimes Against Democracy, CUPE, CUPE 3903, Doug Fleming, Events, Gary McHale, How low can they go?, International Free Press Society - Canada, Jeff Parkinson, Mark Vandermaas, Merlyn Kinrade, Native Lawlessness, Native Protests - Caledonia, One Law for All!, Planet Earth calling, Racial Policing, Tom Keefer, VoC News, VoC speeches. Bookmark the permalink. Caledonia reflects the power of the barrel over the power of the bible. It permits the threat of violence to usurp the legal authority of a nation. Weakness in Ontario politicians sworn to uphold laws enables hooliganism. Caledonia has echoes of the 1936 occupation of the Rhineland.